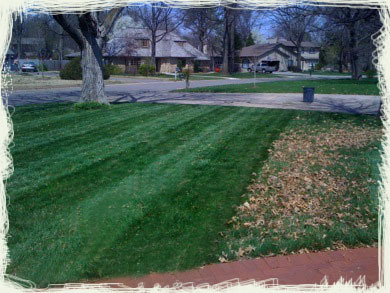 You need to have full removal of leaves from flowerbeds and lawn area to give a pristine look to your landscaping. Our vacuum truck takes care of this tedious job in a fraction of the time leaving your yarn looking and feeling perfectly maintained. Why is this important for not only your lawn, but the environment and your neighborhood as a whole? if your leaves are not properly removed and they end up in your curb-lines by the street or blocking a drainage ditch everyone is effected. In autumn, large amounts of leaves become a source of water pollution. Once they reach the waterway, the leaves release nutrients that contribute to the accelerated growth of algae which can be detrimental to fish and other aquatic life. Leaves can build up along curbs, gutters, and ditches and block storm water so that flooding occurs. The resulting standing water may attract insects such as mosquitoes that carry diseases like West Nile Virus. Should a major weather event occur, blocked curb-lines and ditches can lead to flooding of roadways and can also result in personal property damage including flooding of your home. Protecting our environment, including our recreational waterways, as well as keeping our neighborhoods clean and safe, is a powerful incentive to most folks. If you keep leaves and debris out of your storm drains, gutters, and ditches, you can help keep our waterways clean and healthy and provide a better environment for native plants and animals. The result will be cleaner, safer, more enjoyable communities and recreational areas. Plus, making your landscape and property in Frederick County free of leaves and debris is part of our job and we love it! We service all areas in Frederick County, including the following: Adamstown, Bartonsville, Buckeystown, Frederick, Middletown, New Market, Point of Rocks, Thurmont, Urbana, Walkersville.